One of the many things I have enjoyed about becoming a mother is all of the time I spend reading books with my little girl. Aside from just the simple pleasure of snuggling up with her and sharing a book, as an illustrator it's been interesting to see both some truly amazing children's book illustration as well as the amount of really terrible examples of the art form. This weekend past, we found an old copy of a Golden Book of the "The Three Bears". This edition was illustrated by F. Rojankovsky. I don't know anything about Rojankovsky, so I need to do a little homework there. 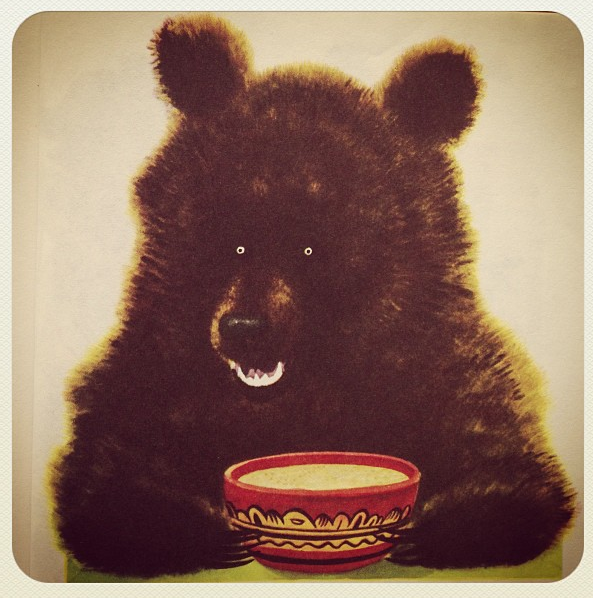 His/Her illustration of Papa Bear discovering that his porridge had been sampled by someone, blew me away. Aside from just being very beautifully painted, I love its feral-ness, its darkness. I feel like we just don't see this kind of illustration in children's books anymore. Are we too worried about frightening children, perhaps? Isabel, my daughter, wasn't afraid though. I think the illustration helped her to understand why Goldilocks wanted to hightail it out of The Bears' cottage! Furthermore, the illustration represents, to me at least, some change in our relationship to nature. In many of the older children's books we have, there is an attention to detailing the natural world, that seems to be lacking in manycontemporary books.The bear in the illustration above is undoubtably a BEAR. Not a cute, cuddly cartoon interpretation, but a feral (albeit porridge eating! ), grumpy, lumbering bear. The illustrator has allowed for his bear-ness. This is not to say that there aren't contemporary picture books and illustrators that don't dumb down the material, it just seems like one has to dig around a bit more to find them. I'm not sure I'm expressing all of this well, but I welcome any of your thoughts. I have been wanting to do some posts about how we represent and view the natural world currently, and in the case of those of us that are close to a little one (whether it be by being a parent, aunt, uncle, educator etc.) how we are passing that on to the next generation. Interesting thoughts. I'm in between children and grandchildren, so haven't seen childrens books for many years. I like what you have to say and hope you can contribute to bringing back that quality of the wild that is so wonderful and important for children to experience. Have you heard that maurice sendak quote - "let them wet their pants", in response to the too-scary-for-kids argument? It is a good one, I think... Some kids embrace darkness in stories and in nature. The "scary" picture books from my own childhood are the ones most vivid in my mind now (and most dear to me). They stand out as deeply beautiful, not scarring. So I agree with all you've said, and I wish our culture had a bigger appreciation for science, which is entrancing and lovely and gory and everything else (not a lesson to be protected from!). Also, that bear is truly wonderful. Cynthia and Zoe, thanks so much for sharing your wonderful thoughts. That is such a great, perfect Sendak quote! And I so very much agree with having a richer appreciation of science; a broader definition of beauty is in order. I still get the willies when I listen to Prokofiev's Peter & the Wolf because of a 'read along' children's book I had as a kid with the fiercest wolf I'd ever seen. I would give an arm and a leg to have a copy of the book/cassette right now :-) I love the eyes on this bear so much. It's wonderful! Kathleen and Geninne those are great examples! I love Peter and the Wolf too. That was one of my favorite stories when little. I haven't seen that animated version! It looks amazing, and I'm definitely going to watch it! First of all, I have always loved this copy of The Three Bears. And I agree with you about illustrations in children's books changing- I was just discussing this the other day with a friend, (and sounding very heated about it I am sure!). It is as if many books "dumb kids down" now- with overly busy, overly silly pictures. I want books like this one with real art, which tells the story in itself- that a small child who cannot yet read can pore over and stare thoughtfully at the pictures. Part of the point of these fairy tales to begin with were cautionary or moral tales for children- so to depict father bear as such- dark, wild, and maybe a little scary- it's true to the story's intent. And yes, we today are far too removed from the natural world. I read somewhere once that children in a case study were asked to identify some very basic animals- when shown the photos they could not tell. When shown a cartoon, they knew what it was. Anyhow, I really appreciate this post- and I love LOVE your art!!! Hi Melanie! - Thanks so much for sharing your insights. I agree with you whole heartedly. A lot of current material for children seems dumbed down, needlessly over simplistic. And yes, 'overly busy, overly silly images' is right! What's wrong with exposing them to a little more visual (and emotional) complexity? Ooh gosh, that is a lovely bear, scary too. I'm coming from a different angle here, I've just illustrated my first children's book, about sleepy bears...they had to look cute ish...although I tried to make them look like real bears. It was all about going to sleep, stretching, yawning, dreaming etc, quite difficult to make bears do this, especially the yawn!! I'm hoping to have a copy soon, you can maybe check it out on my blog, see what you think? I love the music to 'Peter and the Wolf', I don't remember too many picture books from when I was really little,(so long ago) just the Famous Five books I read later etc. I read such a lot of different books to my son, always a favourite time of day! Hi Julie - Congrats on the new book! I would love to see it. I am definitely not against cute. I think what I am more concerned about is a sort of watering down of imagery and content overall. @Nerthus, Thank you for bringing up a great point which is the undervaluing of visual literacy. Yes, of course learning to read is very important obviously, but learning a good visual vocabulary is important too. I loved the book examples you gave, and nice that both of your girls are in the visual arts!